Today's Free Music Friday comes courtesy of a blog that has helped me greatly in learning about subcategories of noise and extreme sound experimentation. The Static Fanatic shares noise of all varieties and has been a regular read of mine for the past few months. 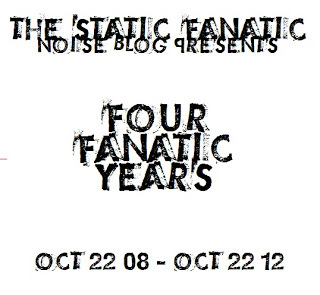 To celebrate four years of blogging and supporting the noise community, The Static Fanatic called upon a few of their friends to contribute tracks for a free noise compilation. Four artists contributed one track each, approximately four minutes in length, leaving us with a perfect glimpse into the many directions noise can travel. Opening track, "le quartier des spectacles en ruines" by GRKZGL sounds like the inner workings of a great machine, designed to smash or otherwise destroy other machines. There are lots of winding noises and static layered upon each other, with just enough empty space in between to create a tension and sense of anticipation. It's the first I've heard from this artist, but it's definitely a promising introduction. chefkirk follows with "the roger h smith track," which is named after the man behind chefkirk. It's a hybrid of organic sounds and clipping high frequencies, that blend together to create what is apparently a representation of Roger H Smith. I like the shifts in tone presented here, although some of the denser and higher frequencies may be overwhelming to those who haven't yet delved into noise. I've heard a few tracks from chefkirk before, and I definitely recommend checking out more from him, as it's a compelling and unique collage of sounds. Justin Marc Lloyd's track. "touch, teach and hug each other," is much friendlier than the previous two, providing a soothing and chirping soundscape to contrast the harsher frequencies presented earlier in the compilation. I've never heard from him before, but this minimalist noise paired with light melodies in the background works really well for me. It may be the best introduction on this compilation for folks used to friendlier sounds. Closing out this brief but wonderful compilation is Carl Kruger's track, "glacial decay (edit)," which features some excellent background noise paired with the hum of dozens of separate tracks of glitchy electronics. I haven't yet developed the proper vocabulary for explaining noise, as I don't know how to create it myself, but this song is incredibly busy, yet it doesn't have the overwhelming intensity of the GRKZGL track. Instead, I feel as though this song is a glimpse into the future, perhaps when all life ceases to be and machines are left to fend for themselves. Another excellent tune and a perfect way to wrap up this compilation. In case you missed the link above, click here for the download and be sure to pay The Static Fanatic a visit. You may just find your morbid curiosity gives way to actual enjoyment. Be sure to visit each of the artists' sites as well, as each of them seems to be quite prolific and may have your new favorite album just waiting at the click of a button. Thanks for reading and enjoy the static. Thank you for reposting this comp. Your brief but succinct reviews of each track are exactly how I like to describe releases, too. Carl Kruger's website is currently just his discogs page - http://www.discogs.com/artist/Carl+Kruger . Thanks for helping with the link! The only thing I love more than free music is helping support the artists who allowed me to share it for free. Keep up the excellent blog, I'll keep reading it.